This photo was taken near Vail, Colorado. I was heading home after a four-day autumn photo trip when I noticed this large aspen grove. I spent about an hour wandering around looking for different shots from several angles. 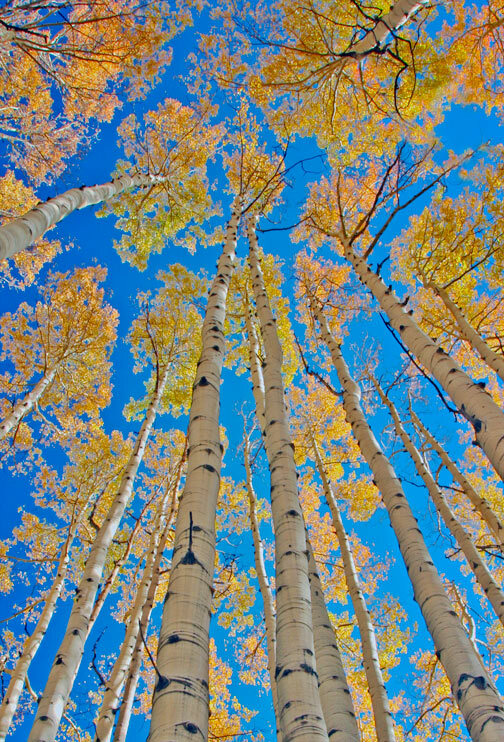 I used a wide-angle lens to capture the aspen trunks near the ground, and the yellow aspen leaves against the brilliant blue sky. Since blue and yellow are complimentary colors, they tend to brighten each other when they are next to each other. Photo © copyright by Mike Barton.